Translation is one of those art/science things, much like writing novels. And, much like novel writing, there is a lot of information available about technique, methodology, finding work, marketing… Some good books cover how to keep yourself on task, but I’m not so good at that part of the job. I have often suffered from procrastination. I think most of us have. Sometimes the hardest part for me is to just sit down and work. I usually know what I have to work on, but keeping myself on that task can be challenging at times. An Italian (thus pomodoro, Italian for tomato) grad student was working on studying for his exams and was facing this kind of dilemma: how to stay focused, but still stay fresh enough to study everything he needed to. He came up with an idea, probably not a new thought, to do intervals. He had a kitchen timer, shaped like a tomato, that would time up to 25 minutes, so he went with 25 minutes of work and a five minute break, with a 15-minute break after four “pomodoros”. That’s the short version. I had a timer on my iPhone that was pretty straight forward, a circle that drew itself and shrank and numbers on the screen counting down. It worked alright, and I liked that it ticked like a clock, even in the background of music I was listening to. But the design was uninspiring. When I gave up my iPhone and moved back to the Android world (with a Samsung Galaxy Note 4), I went looking for a timer. 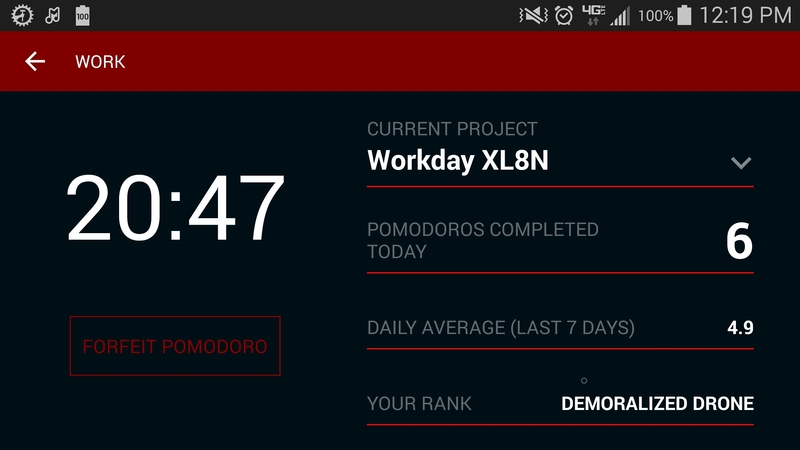 Most of them looked a lot like the iPhone one, and then I ran across Pomodoro Challenge in the Google Play store. The visuals are industrial, the colors are very attractive (to me), and the slight mean streak reminds me of another of my favorites – the “sudo” (or superuser do) command line utility in Unix/Linux/FreeBSD. If you compile it with insults active, it flips you a ration when you mistype your password. Pomodoro Challenge does similar things. When you start out, you are given the rank of “Unrepentant Slacker” and work your way up from there. So far I have worked may way up through Recovering Slacker and Dead-eyed Drone to Resigned Attendant; there are 11 higher ranks, I’m looking forward to seeing how high I can go as I use it daily – a few days before Christmas, then five days off didn’t do much for my standings. Anyway, this app is fantastic. Between the design and achievements, I am really enjoying using it. The Pomodoro Technique works. Ha! Love it. Now I’m quite curious to check it out. Cheers!